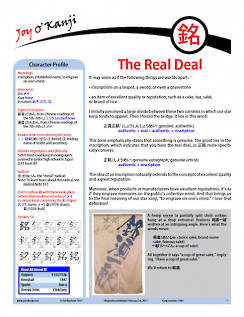 This kanji often gives items a stamp of approval. Inscriptions on metal vases, pottery, or swords convey authenticity. The prefix 銘- deems products (e.g., cakes and sakés) “exclusively made” and “of high quality." The term for "brand name" includes 銘, drawing on the connection between 銘 and reputation. And a great product engraves itself on your mind—again involving 銘! June 29, 2017: p. 11: Altered the definition of 銘醸 and added an explanatory sentence after that.